Getting dressed every morning seven days a week can be stressful. To decide a new style to don every day is an even harder task. Even with a closet full of clothes, it simply feels as if you have nothing to wear. Here is where Qyaari comes to your rescue. 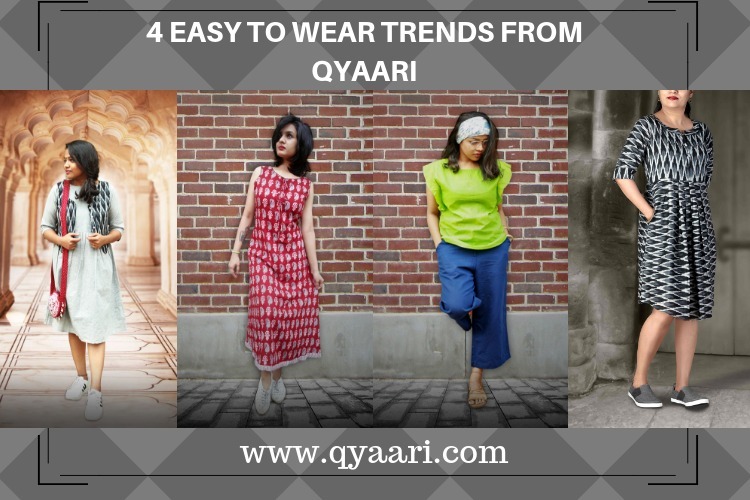 Qyaari not only has stylish options to choose from, but its fabrics are very comfortable on the skin, are environmental friendly and good for the Indian climate. So go ahead and create a fashionable makeover with Qyaari. This dress can simply gel as your office attire. Of course, you will able to move freely, feel comfortable, look great and get dressed with ease. You can also have fun accessorizing it to enhance your personality and your office environment. So transform your mundane office dressing into fun! T-Shirt are perfect for all days & occasions since they layer so well and are cute on their own! They are the ultimate lightweight material and the beauty of them is that it gets you ready with minimal effort and is easy to carry. T-shirts are so versatile that they can be matched with almost everything, be it footwear, purse, makeup, shades or seasons. What’s more, t-shirts have also started to replace blouses when draping sarees! Floor length dresses are wonderful to don. They are designed in special styles and patterns, and can be worn on numerous occasions. Full dresses add a stylish look and give the best comfort. Also, it is not necessary to carry duppattas over the outfit. Kurtis are a staple favourite amongst majority of the Indian women. A modern twist to your ethnic kurti is a jacket kurti, which makes a charming appeal. Pairing a printed jacket with a solid kurti or vice versa will enhance your style statement. Top it with a pair of accessories, and you will look glamorous and more fashionable in a simple way. So go ahead, create a charming addition to your wardrobe with this trendy jacket kurti. Come explore Qyaari’s exquisite range of Indo-Western styles, crafted seamlessly from our unique collection of fabrics for the beautiful young woman out there, which is you!